There’s always excitement surrounding Marathon Monday in Boston: 114 years of history, a day off from work and school, baseball at Fenway, 26.2 miles running from Hopkinton to Boston. Lots of people, lots of runners, lots of cheering and news all about Monday. But the Boston Marathon Expo is one thing I’m looking forward to this year—almost as much as the race (and sometimes more judging from my lack of training this winter). The expo opens at 2 p.m. on Friday, April 16, and runs until 6 p.m. on Sunday, April 18, and while the purchase options may diminish as the event wears on--runners like to shop at this expo too especially if race day calls for rain and you left your rain gear at home--you'll still find some of the best new items for the running marketplace. Whether you're running or just accompanying a runner, here's a brief rundown of some gear to look for before dashing back to the car or hotel after picking up the race packet. Adidas. You can't miss this booth at the main entrance to the expo--if you're heading inside after picking up your packet--as it's huge and filled with everything from T-shirts to the racer favorite jacket. In addition to all the gear and marathon-logo'd wears, check out the demonstration of miCoach. (update: stay tuned for a miCoach entry of its own, I was intrigued) Launched in January, miCoach ups the ante for runners, especially beginners and those of the techie variety, and provides real-time audible coaching as you run. Pacing, heart rate zones, calorie burns--it'll keep you on target. Asics. Ryan Hall is an Asics guy but he'll be laying low over the weekend--big race on Monday that he's trying to win, I think we can see why. But that doesn't mean to skip out because the celebrity tie-in is absent. 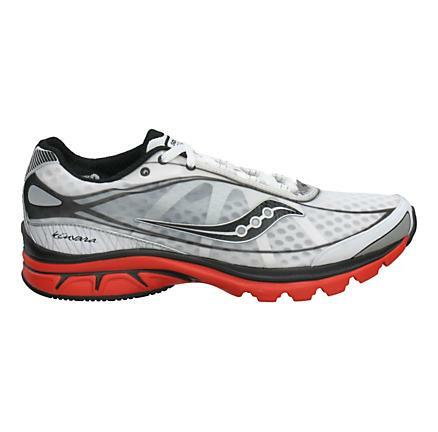 Browse the shoes, gear and Boston wearables. New Balance. 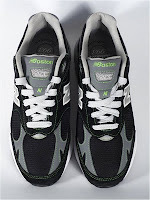 'Run Faster' in Boston and score a sneak peek at the new New Balance 759, rolling out for fall 2010. You can purchase the shoe at the expo--or win a pair or other goodies on-site--and be one of the first people on the streets with this newbie--after marathon weekend, it won't be for sale again until July. 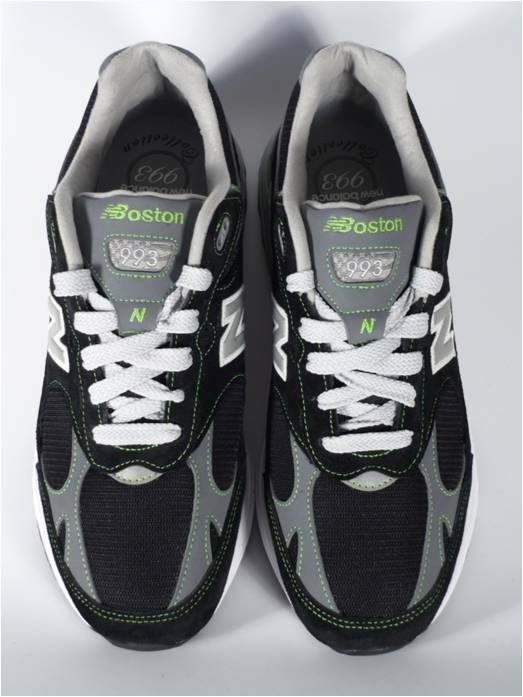 Or if you truly want to remember this Boston experience, consider the Limited Edition Boston 993, a customized version of a heritage favorite. Only 72 of these were made--36 each for men and women--and only available at the Tannery on Boylston Street (approx. $150). Nike. There's always something going on at the Nike booth in Boston--at least the two years I've cruised by. Wait in line for a pace bracelet that gives the runner a break out of how fast to run the miles, taking into account the slower pace on the hills, and a spectator guide so friends and family know when to look for their runner. Bring your SportBand to the expo and Boston-ify it with a gift. Look for the Boston tees and try the Boston-themed LunarGlides. I loved the Chicago special but Boston's different: black shoe with blue laces and white Dynamic Support, a BOS tag on the tongue and a pirate ship inside on the heelbed. Polar. Heart rate monitors and cadence calculators are one thing, social media is another, but Polar is doing both expo weekend. Join their Saturday Tweetup from the expo: http://twtvite.com/m0jys9. I know I say I'm not that into Twitter--I'm trying, I really am (@fitink)--but this is one thing I'm going to have to check out, for curiosity's sake too. Saucony. Who doesn't like new shoes? Saucony's unveiling their latest, the ProGrid Kinvara, at the expo. Tagged as a shoe where minimalism meets maximum performance, it's lightweight, minimal construction allows your foot to do what it wants to naturally. I just can't help but think about barefoot runners on this one. That's only a taste of what's at the marathon expo. Two rooms are filled to the hilt with booths of exhibitors from gear to charity programs to food to other races to run. That reminds me, Gatorade is unveiling some new products at the expo too: here's more info about that (scroll to the end of the page). Back to the expo...we're talking book signings, massages, food samples, shopping and more. Find more details here at the expo-specific site. Photos provided by New Balance and Saucony.